ZeoFill from M3 Creative Media on Vimeo. THE ONLY ZEOLITE WHICH HAS AN 80% ABSORPTION RATE NO ONE ELSE CAN COMPARE! 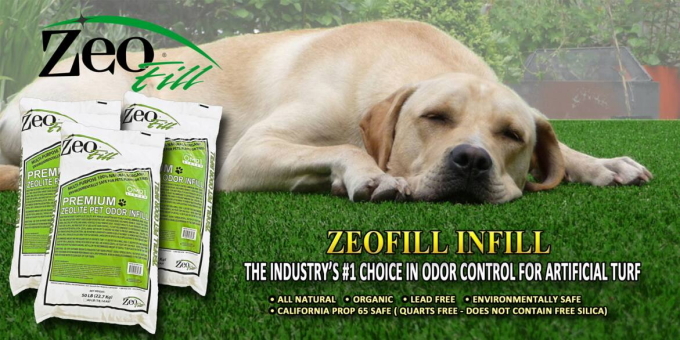 ZeoFill® is the #1 choice for synthetic turf infill for pet owners, areas with playgrounds & Sports Field application. Infill is used between grass blades for lawns that aren’t real or artificial. Infill is spread down into the turf fibers to help the blades of grass stand up. It also protects the grass backing from ultraviolet rays which could eventually cause damage and void warranties. Some artificial grass infill options are ZeoFill®, Envirofill, Durafill, Copper slag, Silica Sand and/or Rubber. For years there has been a struggle for pet owners to decide if artificial grass is beneficial for their dog. Since majority of dogs have accepted fake grass as their bathroom, their owners had to water down and flush out the urine bacteria from the turf. Many turf manufacturers have made antimicrobial pet turf to resist the bacterial ammonia from adhering to the turf fibers. Silica sand would hold ammonia urine resulting in a great deal of smell. ZeoFill is made out of a 100% natural resource from the earth. It is different that any other infill because ZeoFill is a negatively charged honey-combed molecular structure which absorbs the urine like a magnet and prevents the ammonia from forming a gas which is the main cause of smell. ZeoFill Infill will pull any gases towards itself and hold it until sodium ion (Na+) in rain water releases the magnetivity and the force of heavy rainfall will flush out the bacteria, forcing it through the turf into the ground making your turf virtually new again. The sodium forces the calcium ions out and recharges the ZeoFill when dry. With ZeoFill® Save Water! There is no need to water the grass all the time to wash away urine smell. In fact, no need to water your turf down too often with ZeoFill® because you want urine to be absorbed in ZeoFill granules not the water from your hose. You can water it down if you need to clean it, but keep it to a minimum. If I don’t have ZeoFill, how to clean the bad bacteria in my turf? ZeoFill® helps control the urine odors but will not remove bad bacteria. With any synthetic turf, you still have to maintain it by removing bad bacteria with an enzyme cleaner such as PE-51. Use this enzyme if your area doesn’t rain periodically in a given year. We recommend this enzyme cleaner because it is made & shipped in a live liquid form. Enzymes made from a powder will not properly clean ZeoFill granules. Only a live liquid enzyme such as PE-51 will control your turf odors. PE-51 covers 1500 to 1800 square foot of turf, comes with a garden hose attachment and the enzyme has a shelf life of 30 years. Helps remove dog & cat urine on any surface. 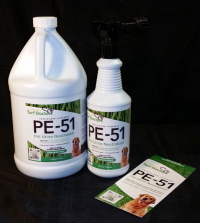 PE-51 & Our newest indoor product BioFresh assists in elimination Urine Odor, Fleas, Bed bugs, Lice, Scabies, Crabs, Mites, and more. How can I tell if an enzyme cleaner is made from a powder? Companies will not tell you if their product is made from a powder before bottling. The only way to tell if their enzyme is made with a powder is the bottom of the bottle will show granular residue after it has been sitting a while. No matter how compact this infill gets, ZeoFill® will drain 100% never having to worry about drainage. A perfect solution for an artificial grass tennis or bocce ball court. It will hold over 80% of its weight and will evaporate water slowly over time cooling the turf in warmer weather. ZeoFill® will not deteriorate in excess of limits over time making it a choice infill for sports fields, pet grass, landscape and putting greens. It is environmentally safe and listed as organic by OMRI. Zeolite dust will not harm the body like some infills. Zeolite is a known substance which is sold as an animal feed additive or chicken feed so it is perfectly safe for animals or children if swallowed. ZeoFill® has been approved by leading manufacturers in the US to be used as an infill due to the purity, Mohs hardness and most of all it doesn’t contain quartz or crystalline free silica. ZeoFill® recommends it is best to be installed on top of the grass inside the turf fibers to help control the odors but installers who use a non-infill product prefer to use ZeoFill® under the turf which is not as effective and voids any warranty with ZeoFill®. Quartz is the second most abundant mineral in the Earth’s continental crust, after feldspar. Its crystal structure is a continuous framework of SiO4 silicon–oxygen tetrahedra, with each oxygen being shared between two tetrahedra, giving an overall chemical formula of SiO2.